Baby, it is COLD outside! What do you do? Mostly I work out at my local community center gym and indoor pool. But when I get truly desperate to get out of the house, I just bundle up. This morning, I walked for 45 minutes in -5F temps with a -20F windchill. My gear: snow pants, wool socks, running shoes, jeans, undershirt, long-sleeve shirt, fleece, winter shell (jacket designed to work with the fleece), wool scarf, neoprene/fleece face mask, ear-protecting headband, hat, mittens. If I'm running, I swap the jeans for running pants and leggings, ditch the snow pants, and swap the fleece/shell combo for my running jacket. My feet and hands get chilled at first, but once I warm up (very brisk walking and some light jogging), my body adapts, the capillaries open up, and heat floods my hands and feet, and then they stay pretty warm, as long as they're protected from direct contact with the wind. I've had this ability my whole life - it's the same issue that makes working out in high heat/humidity so horribly uncomfortable and potentially dangerous. when its cold outside, I try to do my exercises in the living room. Another snowy day here in Chicago as well. The cold is challenging cause It makes you want curl up in a ball. I do at home workouts but that gets boring I sometimes goes to the gym near me. I want to go to the gym more for entertainment, it's nice to change your environment but it requires a lot of push especially with work and home life. I will be goi ng to the gym today. My goal is to workout every other day. I just have to make it through this winter cause summer is bo problem I love walking long distances. Dress appropriately for the weather. I have lined workout pants, and dress my torso in layers - sports bra, long sleeve Under Armour nylon shirt, sweatshirt with hood, and either a fleece or ski jacket based on temp and moisture. I also wear a headband which I wear over my ears, and gloves. If really frigid and windy, a scarf for my face too. I am fortunate to have a treadmill and bicycle trainer, I normally walk from my office to get lunch, when it is to cold or raining, I go to Wal Mart and do some laps,then get a sandwich from the Subway. Get out the scarf, heavy mittens, and my favorite wool cap and off I go. Not always with an eager attitude, but I get it done. I have my second road race of February scheduled this Saturday. It's a 6.55 mile (half of a half marathon) event. The forecasted low is around 6 F, which is about 10 degrees warmer than it was for my 5k last Saturday. The roads should be in better shape, so hopefully I won't need my traction aids for my shoes but I will have them available. I go outside and walk anyway. Fresh air and cold boost the immune system. JERF, your last sentence: "Find an activity you love to do and do it!" sums it up. I love your biking stories. Personally, I love my run/walks. Here in Minnesota, I can find road races year round.There maybe aren't as many in December, January, and February but they exist. I did one race in December, two races in January, and have 2 in February. 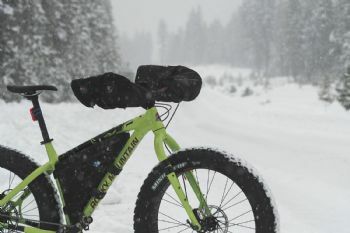 Those fatbikes really aren’t just a winter bike! They work so well in sand that a lot of beaches rent them by the hour. And I have found that they work well when the weather is around freezing. The bigger tire gives so much grip. That photo isn’t my bike, it’s just a stock photo I used. My first fatbike was a cheap and heavy bike. I didn’t know if I’d like it and use it enough to justify spending money on it. I thought I’d be cold, and to be honest it did take a while to get the layering sorted out. Turns out I love it and I sold that one and upgraded the bike. It’s actually a lot of fun. The changing snow/ice always keeps you on your toes. Then you’ll get a day with ‘hero’ snow and the ride is amazing! I hang out with a bunch of crazy mountain bikers so there’s usually someone to ride with, but I like riding on my own too. My husband has been riding his fatbike year round for over 10 years. He was the first person in our area to get one. People used to make fun of him whenever we would go riding, now a lot of those people have one too! Find an activity you love to do and do it! Celebrating 9 years with Spark (2007) on November 30, 2016.
bundle up good and take a good long walk as long as it is not icey slick. JERF: admire your perseverance on the biking! Since our weather is much more mild it wouldn't pay back to invest in changing and outfitting bikes for me... so mine stays in the garage if we have snow, ice, low temps. Stay Safe out there! We're lucky in that we've got a little exercise area in our house that we both use. When we are hiding in our hermitage we've got a place to get a workout that we both enjoy. I am clothing winter clothes here in France..
Got me a recumbent cardio bike to ride on the days it too cold to get out..
Inspiring thread. It's hardly cold here compared to some places, but feels cold to me cos we're not used to it. An indoor mile or two would get me warmed up - I have a Jessica Smith DVD that I like. WAY too cold for me to go out in a wheelchair. I do the sparkpeople seated videos, you tube videos, and I have a goal on my inside recumbent bike so I can take my outside one to my niece and ride around her beautiful lake with her this summer! Rode my fat bike outside yesterday for almost 2 hours. I slogged through the snow for 13kms. Layers are the key. It takes me forever to get ready to go out. My upper body I have a lot of layers that I can take off as I warm up. -5F here today I’m going to wait a few hours for the sun to come out and warm things up a bit before I go out for a ride today. Hopefully the stuff I rode on yesterday is packed down nicely for a easier ride. ETA - It was a great ride! Lot's of ways to work out at home. I've just remembered modified jumping jacks. They're awesome! Yeah....that race is an annual event!!! They did it and some people finished. Yeah, we're that bold/crazy/weird here It's cool you have volunteered for it and your husband has done it. I have been doing YouTube videos and will continue until it gets warm enough to walk outside. I really enjoy YouTube because there is so much variety and I can do it anytime I feel like it. I would love to get a treadmill, but that's down the road. The record was set for the fastest time ever this year! My husband has permanent damage to 4 of his toes from a different winter ultra marathon 3 years ago. I love winter biking and hiking but you really have dress appropriately and pay attention to your extremities! ETA - Oh and Minnesota is F-N cold! I’d love to go back... in the summer! Snow, cold, wind and ice in upstate NY. I will strive to do extra steps in the house. I am Minnesota and we are having the coldest weather in 25 years. Our actual air temperature lows today and tomorrow are around -28 F. We are also experiencing the coldest wind chills in around 40 years and therefore "feels like" temps are -40 to -50 F. So, I went to my community center's trackyesterday nd got 2 miles of run/walk intervals. I will walk outside in the bitter cold bringing out an old shearling coat and extra warm clothes and especially gloves. I do have a gym and when it is that cold prefer to workout there and it's actually safer. Now my dog needs to get out so he needs his walks, and those are more frequent and shorter. MLAN613, I just read your post. I am also in the Minneapolis area and I wish you the best on your training. Daisy and I have been staying indoors - I have plenty of warm clothes but the snow and ice have just been too much! Yes, thats true your ideas for low cost to going a gymnastics membership. Thank you for your awesome blog post. Our local arena lets public walk laps. So when it is very cold I go there. Run in circles and do the stairs. Adding stairs in is a tough workout. I also have equipment at home I do use. An exercise bike it has been a god send. spark has a ton of free cardio and strength videos you can use as well! i often do yoga at home if i don't want to go for a walk outside. Hibernate! Then get myself in gear. Plenty of things to do at home. I live in the Twin Cities area of Minnesota and we are getting nailed by a "lovely" Arctic Blast. Of course, my training for the my first long race, a 10 mile, of the year starts this Sunday. The weather is forecasted to be sub zero for a bit. So, if it's rough, I can go to the free indoor track at my local community center or, if it isn't too awful, I have plenty of winter gear; it's just a matter of layering and minimizing exposed skin. I do exercise videos. I also have a treadmill, but I know not everyone has one. The videos are cheap around $8-$10. It’s been -20 regular temp for many days recently. With the windchill it’s been more like -35. So it’s a bit dangerous to be outside too long even when bundled up. If it’s above zero I sometimes snowshoe if the wind isn’t bad. As long as it is above -15 oC / 5 oF, I go out for a walk or run, and I'm lucky because such cold is very rare here. Warm underwear, especially those made with merino wool, works wonders! I haven't tried this, but many Sparkers love Leslie Sansone's Walk Away the Pounds videos. If you really want to stay outside, layer up, and make sure your hands, feet, face, and head are covered! I love my mask - it's basically neoprene over the mouth/nose, with fleece over my neck. If you want to get completely out of the cold, try going to a home improvement store and power-walking all the aisles, stopping in the paint department to do arm lifts with the quart or gallon cans, or doing laps at the mall, or if you're close to an IKEA, they're great for doing really long indoor walks! Just started back on exercise, … started 3 mile walk at a local park. Weather is vicious cold and I know it will cost dear to do that today. What do you do to change the plan? I am not a fan of gym memberships, keeping it low cost and local is much more appealing. What is the term for body weight exercise? Walk before or after lunch?